Any pen can be used to keep a record of all kinds of happenings: meetings, classes, important appointments— but with this pen, you can capture audio with just a touch of the pocket clip to make remembering even easier. This stealth pen is a fully functional ball point pen. Record your notes as you are taking them during a meeting or class and then review your notes while listening to the recording for any details you may have missed. 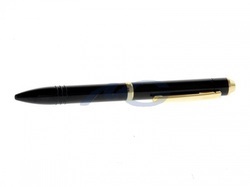 Professional quality pen. The lightness of this "pen" makes it much thinner than most others in the market and it has a higher quality of audio recording. Its advanced microphone features automatic sensitivity control for ideal quality of both near and far sound sources. Either listen from the included earphone with the wire remote control, or re-record files to a cassette recorder or other media using the supplied re-record cable. Completely covert, no buttons, no lights. For true stealth voice recording, you need a device that is undetectable. Push the pocket clip down to start recording. Push it up to stop recording. Its that simple! Perfect for secret shoppers, journalists, and private investigators taking covert footage. NOT compatible with 64 bit operating systems.